This scenario has gone from regular occurrence to cliché; evictions in the Bay Area have become the norm when they were once the exception. As rents have risen to the highest in the country — skyrocketing well past New York City, according to Zumper’s National Rent Report from May 2016 — it has become increasingly expensive to live in San Francisco. The creative class has been hit hard, getting pushed to the outskirts of the city — most notably, the far western suburban Outer Sunset and southern Excelsior neighborhoods, both a considerable distance away from downtown. Many have crossed the San Francisco Bay to Oakland, where rents have been rising at an equal or faster rate over the past few years, now cracking the list of top-five most expensive cities in America. As a result of rent increases, Oakland has lost a quarter of its African-American population in the past decade alone. Many people have left the Bay Area altogether, journeying south to Los Angeles, north to Portland, or in some cases, across the country to New York. It’s easy to focus on how the city itself has changed (just walk down the tree-lined and wine-bar-littered Valencia Street in the Mission), but hyper-gentrification has manifested itself in more subtle ways, cutting deep into the psyche of many musicians who once called the area home. “It makes me really sad and, honestly, I try not to think about it because I love it so much,” explains singer-songwriter Jessica Pratt, who moved to San Francisco from Redding, California, in 2007, when she was 18. “It’s my home and it always will be, but I feel like I got kicked out.” She’s just one of the many musicians that have left San Francisco for Los Angeles, almost 400 miles down the long and desolate Highway 5. Though the timeline and rapidity of change is up for debate — Sonny Smith of Sonny & the Sunsets argues, “It’s been hard to make rent as a musician since 1996 and it wasn’t that it just happened three years ago” — the fact that the city has transformed into a playground for a young, wealthy startup class is not. The success stories of Facebook, Uber, and Twitter have been praised by our nation’s leaders, immortalized by filmmakers. But as the region’s tech industry grows at an exponential rate, its music scene is trending in the opposite direction. 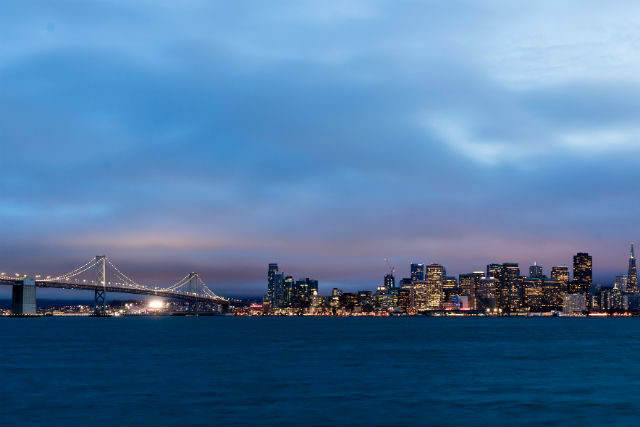 The creative class that put the City by the Bay on the map is quickly being squeezed out. And nothing left makes sense to me / Why must they change what they came to see? San Francisco has always been a boom-or-bust town; the legacy of the Gold Rush of the mid-1800s is omnipresent, whether you’re looking at the street names or listening to Silicon Valley’s business leaders (substitute gold flakes with apps and semiconductor chips). And just as prospectors trekked to California in hopes of finding treasure in the mountains, so too are tens of thousands of recent college graduates. Since the South Bay lacks the nightlife and cosmopolitan feel of nearby San Francisco, tens of thousands of tech workers decided not to live near their places of work, making them the highest concentration of “mega commuters” in the country. These people have consciously chosen to put up with one of the worst commutes in America — one that easily exceeds an hour each way — in order to live in one of the trendiest cities on Earth. Whereas most long commutes are born out of necessity, due to lower housing prices outside a major metropolis, this is the exact opposite. “Developers, who make up a large percentage of what’s driving the culture and a large percentage of who’s moving [to San Francisco], wake up at 10:30 a.m., get to work at 11:30, and stay until 7, 8, 9 or 10 p.m. — super late,” says Brett Goldstein, a business strategy analyst at Google and musician on the side. “That’s show time, when people are supposed to be going out and having fun.” Though his daily travel time varies between an hour and forty minutes and two hours each way, his commute to his previous job, in San Jose, was much worse; Goldstein would have to take a train and three buses, which constantly broke down. As tough as these commutes prove to be, he estimates that 80 percent of the people under 30 at Google live in San Francisco. Because of long hours at work and, at times, an unbearably long, traffic-filled drive, fewer people can find the time to go out during the week. 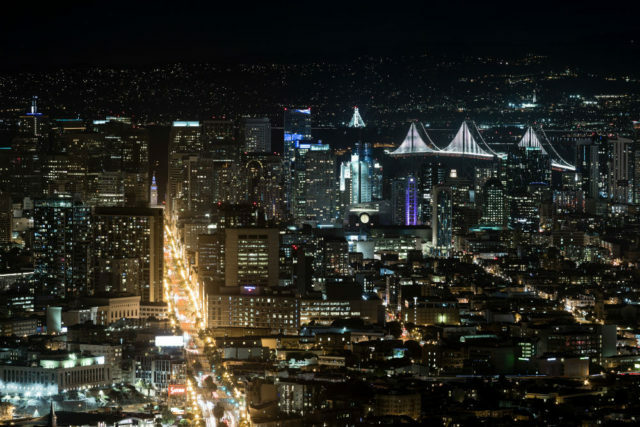 For the most part, the nightlife that attracts these young men and women to San Francisco is only available on the weekends. Lately, local venues across the city have been forced to go dark during the week more often than not. 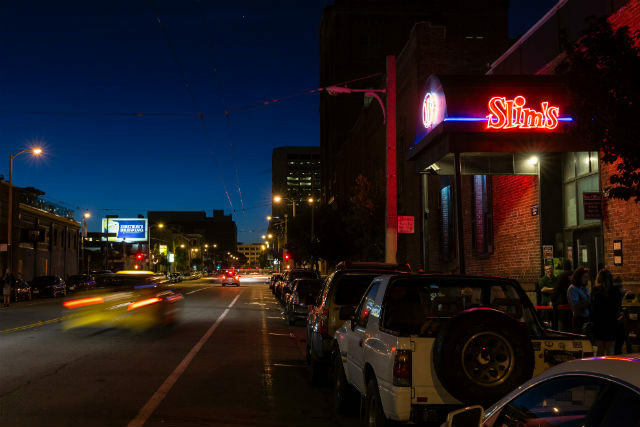 Fell Street between Van Ness Avenue and Franklin Street is now an ordinary block on most Sundays and Mondays; you’d never know that the Rickshaw Stop, one of the city’s most beloved hole-in-the-wall venues, even exists on those nights. But even as smaller venues increasingly shutter their doors for the majority of the week, it’s become harder to find bands to fill concert bills. Mission DIY staples like 12 Galaxies and SubMission have shut down, the latter of which was open for almost two decades. Café du Nord — which famously hosted residencies for singer-songwriters Joanna Newsom, Devendra Banhart, and Vetiver in the early 2000s — transformed from a raucous music hall to a restaurant that advertises half-priced champagne and oysters at midnight. There are still a number of places in which to play, though, including small rooms like Amnesia and the Make Out Room and the larger Slim’s and Great American Music Hall. Smaller DIY venues like the ones that were commonplace about a decade ago in the Mission have begun popping up in Oakland. The Bay Area’s musical history is as rich as it’s varied. Nearly half a century ago, the Summer of Love blossomed with the Grateful Dead, Jefferson Airplane, and Janis Joplin, all of whom played the Monterey Pop Festival, just an hour south of San Francisco. About 25 years later, Mac Dre, E-40, Keak Da Sneak, and Mistah F.A.B. led the Hyphy Movement, one of the biggest regional hip-hop scenes of the late ‘90s, gaining national attention in the mid-’00s. The new millennium saw an explosion of electronic talent, including Kaskade, Tycho, and Dan the Automator. And with a tradition of mainstream success stories — Creedence Clearwater Revival, Journey, and Green Day, among them — the Bay Area’s music scene has always been nationally recognized. Most recently, though, in the past decade or so, the city has been the site of a garage-rock eruption. Singer-songwriter John Vanderslice — along with the prolific Tim Bluhm, leader of psych-country band Mother Hips; garage wizards Kelley Stoltz and John Dwyer; and the cantankerous Mark Kozelek, of Sun Kil Moon and Red House Painters fame — helped lead the way for 21st-century San Francisco indie rock. 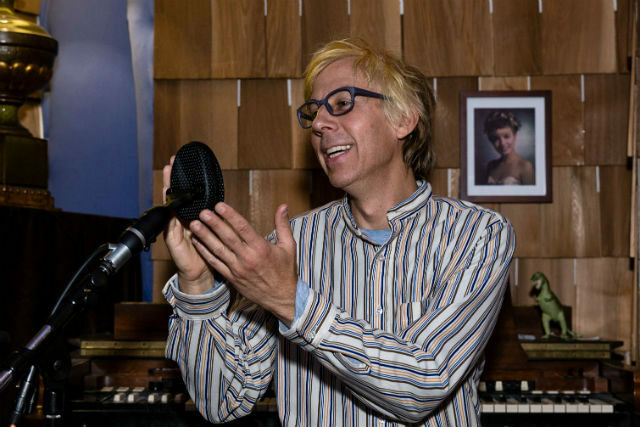 Vanderslice owns and operates Tiny Telephone Studios, one of the most renowned analog recording studios in the country, responsible for albums by Death Cab for Cutie, Spoon, Sleater-Kinney, and hundreds more. Though many big-name acts have recorded in the cozy, wood-paneled, and trailer-esque building underneath an overpass of Highway 101, Vanderslice has given loads of local bands the chance to work in the same studio as their heroes. But he’s felt the sting of the Bay Area’s housing crisis, too; Vanderslice almost lost the studio two years ago when his landlord planned to build on the property. The 48-year old was lucky, though: San Francisco’s complex zoning laws interfered and Vanderslice was allowed to stay. In January 2016, he opened a Tiny Telephone outpost in Oakland. Then, of course, the bubble burst between 2000 and 2002, and the San Francisco rock scene woke from its lull. In the years following the turn of the millennium, the next generation came to the city to make music, including Christopher Owens of Girls (who moved from Amarillo, Texas), Ty Segall and Mikal Cronin (both from L.A.), Tim Cohen of Fresh & Onlys (from Richmond, Virginia), and Michael Deni of Geographer (from New Jersey). They weren’t all transplants, either: Art-rock outfit the Dodos and lo-fi garage-pop act Shannon & the Clams were just two groups that proved homegrown talent deserved the spotlight as well. But less than a decade after the Bay Area’s music scene was revitalized in the wake of the tech boom-and-bust, many of the acts named above would leave the city’s chilly fog for more affordable locales. The average rent in San Francisco had been rising for years but the price increases from 2011 to 2015 were previously unseen in the city’s history. According to Priceonomics, the median rent for a one-bedroom apartment in the Mission rose 90 percent in that four-year period, from $1,900 to $3,610. This trend wasn’t confined to the Mission, either; rents grew 50 percent or more in 21 of San Francisco’s 36 neighborhoods. Because of the high demand and low supply for property (space is limited, seeing as San Francisco is surrounded by the ocean on three sides), the city became largely unaffordable for anyone without a high-paying salary. It now takes about $200,000 for a family of four to live comfortably in the City by the Bay, according to a 2015 San Francisco Chronicle article. The two (relative) stars of the late-’00s and early-’10s San Francisco garage-rock scene — Segall and Dwyer — both moved to Los Angeles in ‘13 and ‘14, respectively. Segall bandmate Mikal Cronin followed suit, later joined by three of the five members of Deafheaven and many more. Some musicians even abandoned California completely: Weekend left for Brooklyn and Chaz Bundick of Toro y Moi recently relocated to Portland. Of those who stayed in the Bay Area, many hightailed it across the Bay Bridge to Oakland and Berkeley, like Adam Stephens of Two Gallants and Meric Long of the Dodos. Artists working in other genres were affected as well, including rising rapper Antwon, who moved to Los Angeles in 2015. The strange may be gone and the weirdos now a bridge away, but people shouldn’t write off San Francisco. With loads of acts still in the area, as well as a good number of venues where performers can cut their teeth, the tech industry will never fully destroy the city’s arts community. But while it’s never easy for a band to make the jump from a local act to a nationally recognized one — the planets have to align at the exact right time — those odds have become significantly steeper for those living in the Bay Area. 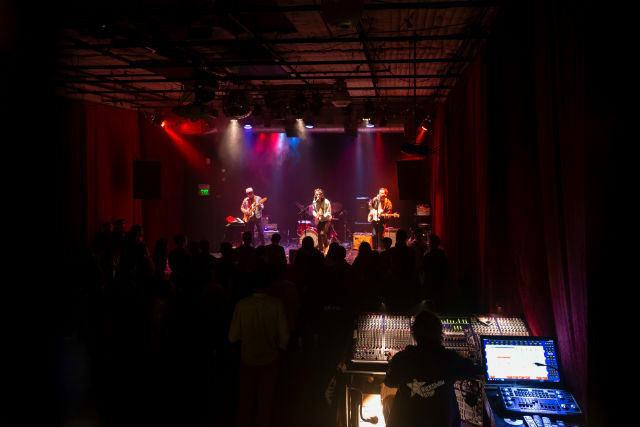 Venues may be turning off their lights and bands might be migrating elsewhere for supposed greener pastures, but only consumers and concertgoers can keep a local music scene alive. 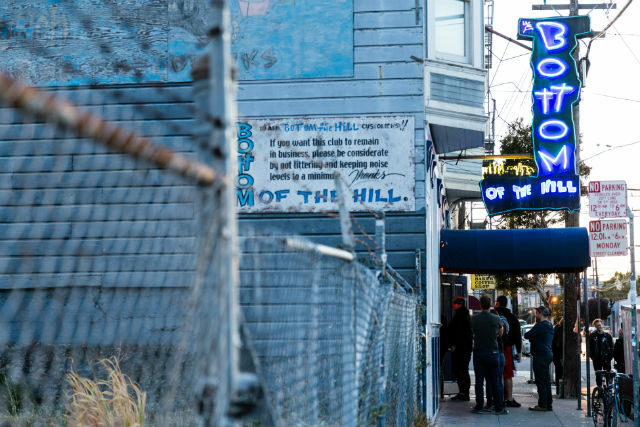 San Francisco might represent an extreme example of how gentrification impacts musicians, but this story is in no way confined to the Bay Area. Music scenes can’t thrive without a loyal consumer base; the future of local music is in the hands of fans.